The National Bank of Hungary has issued their latest coin in the popular “Innovations, Engineers & Inventions” series, with this coin paying homage to one of Hungary’s most celebrated engineers – Abraham Ganz (1814 – 1867) whose name today is still revered and a part of the landscape of today’s modern industrialized Hungary. 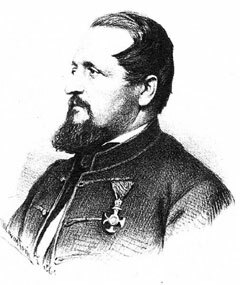 Originally born in Embrach, Switzerland, Ganz is considered one of the country’s most prolific inventors and a pioneer of heavy industry which transformed the Kingdom of Hungary as well as that of the Austro-Hungarian Empire into one of the most important sources for large and heavy precision machinery during the latter half of the 19th century. The company, Ganz Works – was founded by Ganz in 1844 where he established his own iron foundry in Buda. Consequently this factory went on to play an important role in building the infrastructure of the Hungarian Kingdom and the Austro-Hungarian Empire. It was at this time that machines used in the cultivation of agricultural products, steam-locomotives, water pumps and railway carriages became the main products both for domestic use and export. At the start of the 20th century, between 60 to 80% of the factory’s products were sold abroad. From this base, Ganz Works developed as a firm or group of companies which continuously contributed to the development of the Hungarian Machinery Industry. Ganz Works had built a strong reputation for the manufacture of tramcars, but they were also a pioneer in the application of three-phase alternating current to electric railways. Aside from this activity, Ganz also built ships (Ganz Danubius), bridge steel structures (Ganz Acélszerkezet), high voltage equipment (Ganz Transelektro) etc… Abraham Ganz’s name still lives on, 170 years after the initial inauguration of Ganz Works (Ganz vállalatok) which he founded. The name was so important not only in Hungary, but in much of Central and Eastern Europe that the brand was guardedly retained through numerous changes of ownership and administration, even when the works were eventually nationalized under the Hungarian Communist regime. The square-shaped coin, struck by the Mint of Hungary, Budapest is the work of artist Balázs Bitó. The obverse side depicts Ganz in side portrait facing to the left and based on a lithograph. The reverse includes an image of the original factory and plant founded in 1844 as well as one of the most relevant elements of Ganz’s contributions to the industrialization of Hungary, that of the wheel of a railway car together with the year of issue and denomination. The Ganz tribute is the 9th coin in the series, and is available in both BU and Proof quality. For more information on this and other coins offered by the Mint of Hungary, please visit their website at: http://coins.hu/products/basemetal_coins/ganz-basemetal-pp.html Information offered in Hungarian, German & English – international orders dispatched.